I typically preferred to do my photography at sunrise in Point Reyes. There's something so special about being out in the cool morning air as the first rays of light break the horizon. Plus, I could very often have most of the park, or at least my trail of interest, more or less to myself if I arrived at dawn. Every now and then though, the promise of the warm sunset colors was a lure enough to keep me from having dinner at home, and instead catching a sunset in the park. On this particular evening in June 2011, I spent a long time hiking in thick fog on Tomales Point during the evening hours (so much for the warm sunset colors!). As I drove out of the park around what would have been sundown, the skies gradually cleared as I neared the Bear Valley Visitor's Center. I decided to take a swing through the parking lot for a quick chance at finding some quail, and I came across a small herd of mule deer grazing in the tall summer grasses on the hillside. 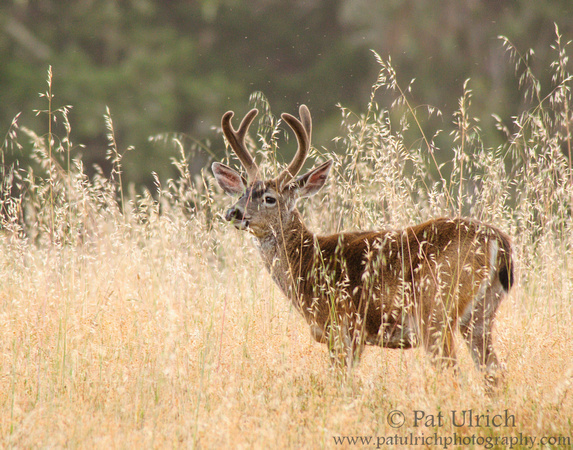 After the sun had dropped below the trees, I captured this buck browsing in the glowing grasses of dusk. View more of my mule deer photos.